Now that the trilogy is complete, it becomes necessary to view the three movies as just that: a trilogy. Each film stands on its own (some better than others), but they are three parts of a whole that follows the same “Hope,” “Failure” and “Redemption” path of one of the more famous trilogies out there. I’m going to assume that this is exactly what Christopher Nolan intended; that he had sculpted the trilogy in his mind to completion, before actually giving Batman this new beginning. Of the three, The Dark Knight Rises is definitely the best, but I won’t discredit the others, as they were all necessary and they were all good in their own way. Batman Begins served the purpose of erasing the garbage that Hollywood Batman had become thanks to Joel Schumacher. 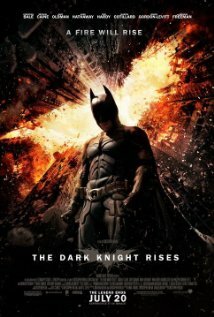 The Dark Knight gave us the fall of the hero at the hands of a deadly enemy. I believe, for truer Batman fans than I, this was not a favourite film. I’ve heard complaints about it taking Batman back to the darkness and insanity that the comics have long since removed him from. But while comic fans might understand that that Batman is the past, the movie is still presenting Batman to a new group of people who haven’t been on that journey with Batman, yet. I had high “just wait and see what Nolan does” hopes for the conclusion of the trilogy and I don’t think it disappointed anyone. Regarding Heath Ledger’s Joker in The Dark Knight, I still think he was brilliant, but I had an epiphany last night. Ledger was a brilliant villain and his performance was Oscar-worthy, but, there was one major thing missing: Batman + Joker = OTP. No, I’m not on one of my crazy ‘ship adventures. Just ask Mark Hamill, my favourite Joker. He understands that there is no Joker without Batman and no Batman without Joker. There is a bond between them that results in so many precious Batman moments, like this, my favourite. The Dark Knight had no such bond. It was an unfortunate sacrifice that had to be made to tell the overall story that Nolan wanted to tell. On to The Dark Knight Rises: Initially, I had issue when Bane appeared doing a poor impression of Sean Connery that often required subtitles and speaker adjustments. I didn’t understand how this related at all to venom and Santa Prisca. Then Joseph Gordon-Levitt appeared and, because he was just so damn good and because I could clearly see where his character was being led, I accepted all things. I let my brain jump off the canon train, as Nolan had wanted me to from the start, and accepted that Nolan had achieved something not easy to achieve: He created a movie for non-Batman fans. And the diehard Batman fans are okay with this. Because, while canon is out the window, it was not dumbed down or amped up ridiculously. It was a movie that worked for everyone by maintaining enough of the key elements of the canon to keep Batman fans happy, while twisting it enough to keep us guessing a bit, and still making it accessible to those who don’t know Batman at all. My husband, with whom I often have to have “suspension of disbelief” discussions, particularly liked the way everything was completely plausible and that it wasn’t just about Batman fighting in the goofy suit with nifty gadgets. It was also about Bruce Wayne and his enemies taking him down in a very practical, pithy way. In fact, I loved that the movie addressed the fact that it wasn’t merely Batman that was necessary for Gotham, but Bruce Wayne himself, and when Bruce decided to lock himself up for eight years, the city started to fall apart. And I love that everyone but poor Gordon knew who Batman was. I have not read Frank Miller’s Batman, but I have read No Man’s Land and Knightfall (and Kingdom Come, from which came my favourite movie moment: “So that’s what that feels like.”) There is a lot of story in those three books (and a few others), but Nolan managed to capture the critical elements to create his conclusion for Batman. And I love that it was a conclusion. Alfred got his wish and we now have a Bruce that has moved on, while leaving the door open for the future – though I sincerely hope they do not make another movie. It’s okay to let a good thing lie, Hollywood. No matter how much more money you can make. I also don’t want to see a Justice League involving this Batman. There’s nothing about this Batman that can convince me he gives a crap about hanging out with gods, cyborgs, mutants and aliens intent on saving the world. This Batman is all about Gotham and I quite liked him that way. I also really liked Catwoman. Because she wasn’t Catwoman (check the credits). She was Selina Kyle. I’m not sure why, but I was rather apathetic towards the casting of Anne Hathaway. Perhaps that was the point of casting someone most know for her mousey roles in the likes of The Devil Wears Prada, even though promo shots made it clear that we weren’t getting a Selina Kyle in her pre-Catwoman, mousey form, as we did with previous incarnations. Selina’s skills and cat burglar status were well established, giving us a confident woman from the moment we met her. There were no cats and, thank the gods, no catnip. Just Selina Kyle in all her glory and Anne made me sorry for ever doubting her capabilities in the role (and I don’t mean her physical abilities and those ridiculous heels). At the end of the day, the only person running around in a goofy get up with a symbol and a silly name as Batman (and the Joker and Two-Face – both psychopaths, which says something about the company Batman keeps because of his mask). The movies made a point of how silly the outfit and name can seem, but in the end, empowered the symbol of the bat, while making it clear that it was more than the man. More than one person who saved Gotham. My only disappointment was Talia – by no fault of her own, really. I’d like to have seen her do and be more, though I’m not sure how so in this movie. I am, unfortunately, very biased because I do not know her at all from the comics and have only really dealt with the obnoxious Arkham City version that whines for Batman and for whom I’m supposed to believe Batman was willing to sacrifice thousands of lives. At the very least, I’m glad movie Talia and Bruce weren’t Damian making, rule the world love buddies. I got the OTP I believe in. Yes, now I am shipping. Deal with it. Saw the movie a couple a days ago with Shade...and I came in my pants.......loved every minute of this movie. Second greatest trilogy ever(Naked Gun being the best). There were many winks/lines to the old comic book writers in this movie. I have to say this movie was better than amazing spider-man.